POLSON — A 34-year-old Hamilton man faces charges of criminal endangerment and DUI after allegedly riding a motorcycle at speeds over 100 mph in Ronan and Pablo. 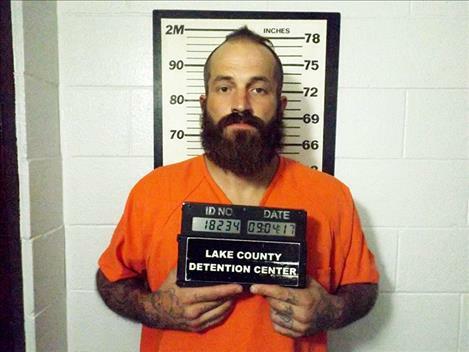 Zachary Lang Bice, who is on probation for a criminal endangerment conviction from 2007, had a blood alcohol content of .106 following a chase that ended when he appeared to crash at Ponderosa Pines Trailer Court in Pablo, a court document states. He allegedly led Confederated Salish and Kootenai Tribal and Montana Highway Patrol officers on a chase at 2:57 a.m. Sept. 4. A CSKT officer turned his lights on behind Bice when he was going 75 mph in a 65 mph zone, according to a court document. Bice then went through Ronan at speeds up to 114 mph and turned off his lights for a portion of the chase. He also allegedly went through Pablo at 100 mph and drove in the wrong lane on Courville Lane, which caused pedestrians to back up. A report from his Helena probation officer said Bice drives on a suspended license, travels outside his district without permission and had made no court payments since October 2015. According to a court document, Bice created a substantial risk of death or serious injury for law enforcement officers and rescue personnel when he entered a restricted area near Kerr Dam on July 8, 2006 and frustrated attempts to remove him. After he was sentenced for that crime in 2007, Bice has been in and out of jail, prison and early release centers, according to his probation officer. He completed the Treasure State Correctional Training Center in 2008, but was sentenced to eight years in DOC with three suspended in April 2010.